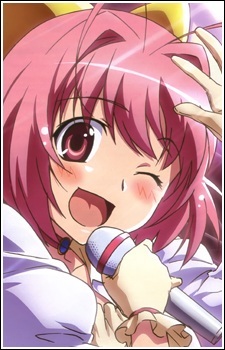 Kanon is the most popular teen idol around for her beauty and singing talents. She was also in Keima and Elsie's class but had not been in school because of her idol status. However, she returns one day. She is constantly worried about the acknowledgment of her existence by others; this fear was so extreme and demonstrated when she attacked Keima with a stun gun after he said that he did not know her. Kanon hopes that her song would "resound in everyone's hearts." She becomes the target of Fiore (Lune in the anime) of Vintage which causes Kanon to be paranoid to the point that she reveals to Keima she still remembers him and confesses her love to him in front of their class. But before Keima can do anything, Apollo takes over and runs away but is soon stabbed by Fiore with a enchanted cursed dagger. Kanon is currently in a coma where Apollo's powers are keeping her alive for at least one week. Blaming himself for not being quick to rescue her, Keima vows to find the other Goddesses to save Kanon/Apollo's lives and has Elsie, a big fan of Kanon, disguises herself as Kanon to avoid a commotion in public.